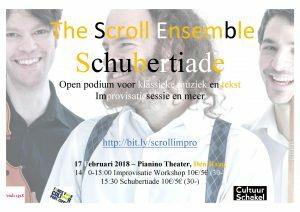 A new improvisation session with The Scroll Ensemble! Second half is my programme Departita. Lunch concerts with the great ensemble The Counterpoints. Concert with our wonderfully kaleidoscopic programme, including Bach, Telemann, Birckenstock and more! I love Telemann's Fantasias. They are a treasure trove in so many ways, but not in the least for improvisation. Read more about this life-time project here and about this workshop where I teach you to start your improvisation journey or keep it going and spicing it up with his Fantasias. Open Stage for music and poems, Improvisaton Session, Workshop classical music improvisation and MORE! Improvising music for "The Man who Laughs"
with our beloved guest Patrick Ayrton. Already in Greek times musicians competed: to get a job, to show off, or because an emperor thought it would be entertaining. Mozart competed with Clementi, Bach was challenged by Marchand (who eventually didn't show up), Scarlatti and Handel competed and many more did. Like today's rap battles, improvisation and competition made classical music a scintillating experience. Just like with sport's competitions, we want to give you more of a way into the musicians' improvisations, with playful 'sports comments', audience picking themes and choosing the winners! So come and sit on the edge of your seat for classical music in the moment. Teaching Recorder Consort, Chamber Music and more next to wonderful teachers such as Eric Hoeprich (clarinet) and David Rabinovich (violin). Muziek van Johann Sebastian Bach en uitheemse blaasinstrumenten uit de tijd van Bach. Through Stichting Huismuziek I introduce you to the world of improvisation. No knowledge of anything needed, literally being able to play a c major scale is enough. Blokfluitorkest met bewerkingen van Mozart's Operas!